The most attractive map of San Diego Bay to emerge from the work of the U.S. Coast Survey. 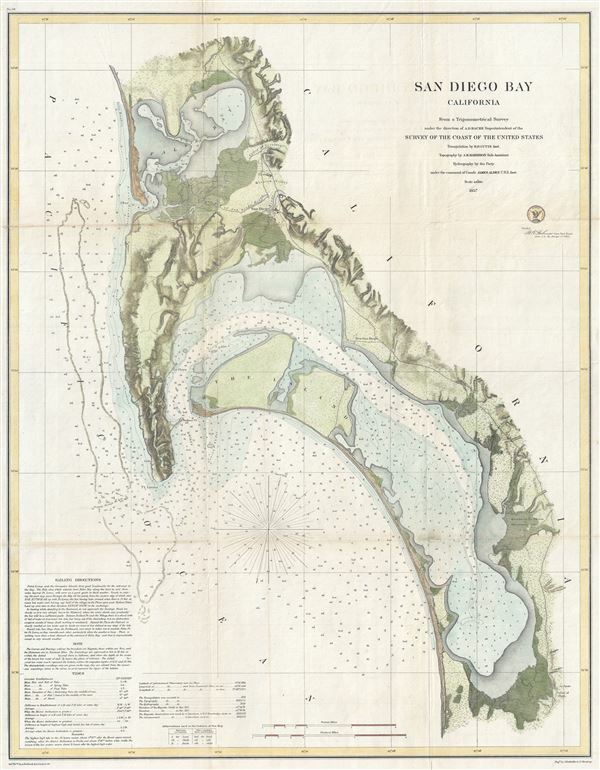 This is the most attractive map of San Diego Bay, California, to emerge from the work of the U.S. Coast Survey. Covers the Sand Diego area from False Bay and the Valley of Las Yeguas southward past Mission Valley and San Diego city to San Diego Bay and the villages of La Punta and the Valley of Ohjia. Offers superb detail both inland and at sea. Inland detail includes topographical features, rivers, roads, and villages. Villages and cities, including San Diego, La Playa, New San Diego, and others, are detailed to the level of individual buildings. Valuable information for the mariner includes innumerable depth soundings, breakwaters, and details on the Kelp Beds of the coast of Point Lonia. The lower left quadrant features detailed sailing instructions as well as notes on the tides and a history of the chart. This cart was prepared under the supervision of A. D. Bache for inclusion in the 1857 edition of the Report of the Superintendent of the United States Coast Survey. The triangulation for this chart was accomplished by R. D. Cutts, the topography by A. M. Harrison, and the hydrography by a party under the command of James Alden. James Alden, Jr. (March 31, 1810 – February 6, 1877) was a Rear Admiral in the United States Navy. Born in Portland Maine, Alden became a midshipman on April 1, 1829 and was promoted to a passed midshipman on June 14, 1834. After serving in the Mediterranean and in Boston, Alden was assigned to the U.S. Exploring Expedition under Charles Wilkes where he served on the USS Porpoise. Alden never quite got along with Wilkes, the expedition's leader. Following the U.S. Ex. Ex. 's successful return Alden was promoted to Lieutenant (February 25, 1841) and assigned to the USS Constitution. He later served in the Mexican American War and participated in the captures of Veracruz, Tuxpan and Tabasco. In 1849, after the close of the war, Alden took a position with the United States Coast Survey. From 1849 to 1851 he commanded surveys along the Eastern Seaboard. Later he was reassigned to the Pacific and was responsible for most significant Coast Survey work on the west coast. At the outbreak of the American Civil War he participated in a number of naval battles and sieges. Late in his career he was prompted to Commodore, the highest rand then achievable in the U.S. Navy. He died in San Francisco on February 6, 1877. Very good condition. Minor toning on original fold lines. Backed with archival tissue for stability.